Divine Mercy, gushing forth from the bosom of the Father, I trust in Thee. Divine Mercy, greatest attribute of God, I trust in Thee. Divine Mercy, incomprehensible mystery, I trust in Thee. 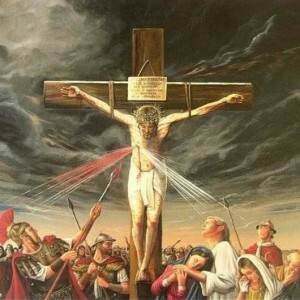 Divine Mercy, fount gushing forth from the mystery of the Most Blessed Trinity, I trust in Thee. Divine Mercy, unfathomed by any intellect, human or angelic, I trust in Thee. Divine Mercy, from which wells forth all life and happiness, I trust in Thee. Divine Mercy, better than the heavens, I trust in Thee. Divine Mercy, source of miracles and wonders, I trust in Thee. Divine Mercy, encompassing the whole universe, I trust in Thee. Divine Mercy, descending to earth in the Person of the Incarnate Word, I trust in Thee. Divine Mercy, which flowed out from the open wound of the Heart of Jesus, I trust in Thee. Divine Mercy, enclosed in the Heart of Jesus for us, and especially for sinners, I trust in Thee. Divine Mercy, unfathomed in the institution of the Sacred Host, I trust in Thee. Divine Mercy, in the founding of Holy Church, I trust in Thee. Divine Mercy, in the Sacrament of Holy Baptism, I trust in Thee. Divine Mercy, in our justification through Jesus Christ, I trust in Thee. Divine Mercy, accompanying us through our whole life, I trust in Thee. Divine Mercy, embracing us especially at the hour of death, I trust in Thee. Divine Mercy, endowing us with immortal life, I trust in Thee. Divine Mercy, accompanying us at every moment of our life, I trust in Thee. Divine Mercy, shielding us from the fire of Hell, I trust in Thee. Divine Mercy, in the conversion of hardened sinners, I trust in Thee. Divine Mercy, astonishment for Angels, incomprehensible to Saints, I trust in Thee. Divine Mercy, unfathomed in all the mysteries of God, I trust in Thee. Divine Mercy, lifting us out of every misery, I trust in Thee. Divine Mercy, source of our happiness and joy, I trust in Thee. Divine Mercy, in calling us forth from nothingness to existence, I trust in Thee. Divine Mercy, embracing all the works of His hands, I trust in Thee. Divine Mercy, crown of all of God’s handiwork, I trust in Thee. Divine Mercy, in which we are all immersed, I trust in Thee. Divine Mercy, sweet relief for anguished hearts, I trust in Thee. Divine Mercy, only hope of despairing souls, I trust in Thee. Divine Mercy, repose of hearts, peace amidst fear, I trust in Thee. Divine Mercy, delight and ecstasy of holy souls, I trust in Thee. Divine Mercy, inspiring hope against all hope, I trust in Thee. This entry was posted in Devotions and tagged contemplation, Divine Mercy, meditation, prayer. Bookmark the permalink.